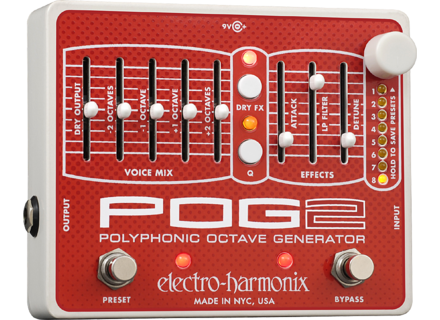 POG2, Octaver/Harmonizer/Whammy from Electro-Harmonix in the POG series. 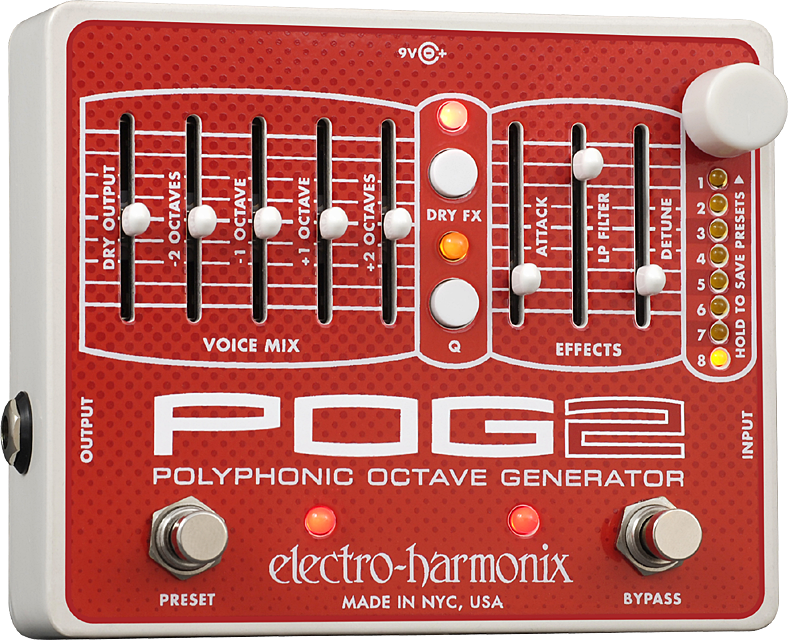 The Electro Harmonix POG 2 is a Polyphonic Octave Generator, you can translate the word Polyphonic to "producing many sounds simultaneously" In the voice section the knobs are ,1. "dry output" to control the volume of the sounds 2. "-2 Octaves" 3. -1 Octaves 4. +1 Octave 5. +2 Octaves , so you have a lot of space to control with the octaves. In the Effects section you have 1. "Attack" that can add swells, fade in speed of the Octaves. 2. "LP Filter" adds resonance to your sound. 3. "Detune" you can enhance your sound. In the middle theres two buttons called "Dry FX" and "Q" with LED lights over them, the "Dry FX" adjusts the effects on the right side you can also select to bypass the effects. 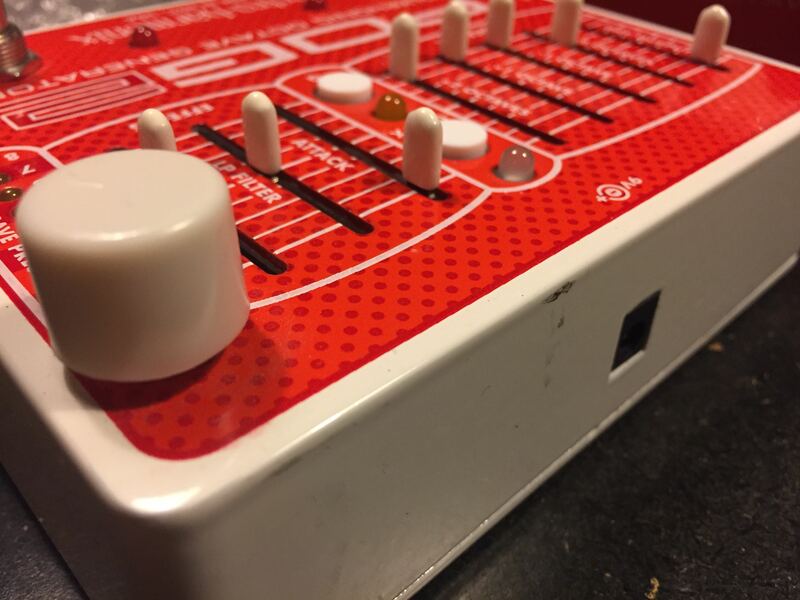 The "Q" button effects the resonance of sound of the Low-pass filter knob. You also have the biggest knob on the pedal, all the way to there right is a Preset control knob, this was the reason I bough this pedal. It gives you 8 bank saves that you can adjust on the fly. Its a true bypass Digital pedal, the power is standard 9v. The POG2 layout is very basic and easy to control and understand. The deeper you dig in the more you will find out. Basic hold down the preset button for quick bank saves. 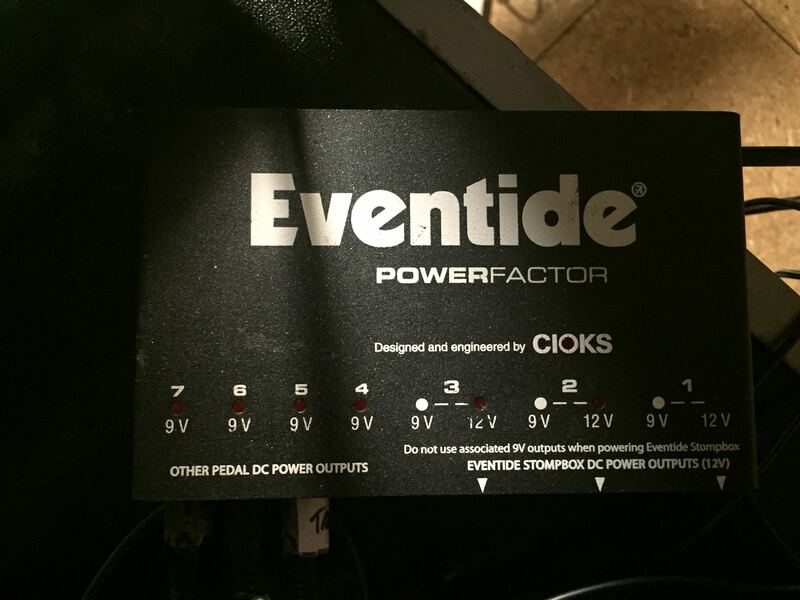 I think for the amount of sounds and knobs it has its a perfect size pedal for me to adjust on the fly and doesn't get in the way of all the other pedals around it. If theres any questions that i would have the manual explains it very detailed. I like to use the Organ sounds + lower octaves sound with my clean sound on my Tele, its very smooth and fits many genres. I also love mixing in other sounds/pedals with it for example like delay or chorus sound also some distortion makes it sound very interesting, its all about experimenting and finding that unique sound that meets your needs. On live shows the pedal stands out a lot especially if I'm using stereo sound with my amps, it catches peoples attention right away. At my studio i like to use the core Shure 57 mic, it reproduces the sound that i hear nicely. I tend to use the Clean channel more on my amp to capture the organic sound of the pedal, but its always fun to mess with that and add little spice to it. The thing i love the best about it is the programmable 8 preset memory, that made my life easier compare to the older version of POG, now all the cool sounds i create i can save and pull it up on the fly without me bending over and switching knobs around. I have nothing bad to say about the pedal it does what its supposed to do. I bought it used so for me the price was fair. The pedal is built like a tank and i haven't had any problems with it at all. I had the first POG which i sold later on since the POG 2 came out, and like i said the Presets memory was the thing i needed the most and got, if i lost the pedal I would buy a new one. nicolas.thonnerieux's review (This content has been automatically translated from French)" an octaver that does its job"
It is therefore a polyphonic octave so you can play several notes at once. I use it for a month, I am satisfied, I wanted to get a sound close to Jamie Hince (the kills) or the white stripes. And it's great! It is also nice to make experimental and improv psyche. Certainly a very good effect, but the new report € qualité/prix...250 it's still expensive. Search in the Cygnus! I personally use it with a Fender Strat and a Vox AC15C1, and occasionally with a Gretsch with larger pickups and it's still cool. Jeremydu33's review (This content has been automatically translated from French)" Satisfied but sold"
Octave pedal editable digital model. Pedal very good, I sold quickly because I did not use in my new shows. In my memories, the sound is really more interesting than the standard pedals that I've tried (Boss, digitech etc ...). Very good quality. At home in any case since I did not even try on a facade worthy of the name. I tested it with my bass with a cell shertler on an Ampeg 4X10 svt3 and body Ashdown. I tried all the pedals current market. c.florent's review (This content has been automatically translated from French)" Unique and "Organic"!" It is thus a polyphonic octaver pedal (basically you can make out agreements "octave" sound without too much porridge) with the ability to save 8 presets. It's digital, but the sauce Electro Harmonix: there is a particular grain in the sound that sounds very far without digital neat personality. Because of the personality, POG2 has it in spades! Connectivity issue if it's classic: In and Out in mono jack 6.35, diet a little special 9.6 Vdc/200mA negative center (which is normally supplied original). I personally tried the 9Vdc/300mA and it works flawlessly. This is the type of effect relatively plug & play: in 2 seconds we get to find settings that sound. And once we understand the 2/3 subtleties (setting the Attack of the low pass with the button Q) POG2 is very easy to use. The big plus is obviously the ability to save settings 8, because the possibilities are so vast that it would have been very frustrating not to be able to easily access all these findings sound. Sound quality issue, it is a little bit all or nothing: you either love or hate. 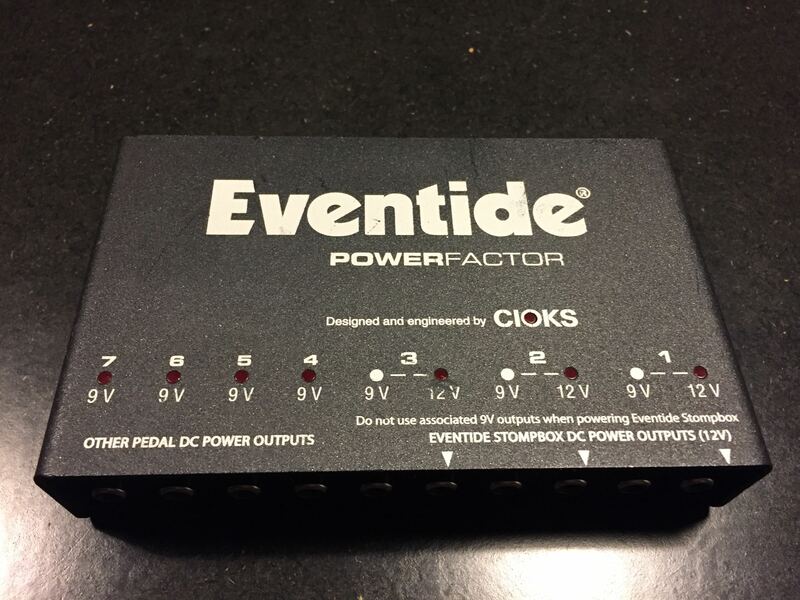 Indeed, if the POG2 is much better than some digital Octavers among brands (Boss and Digitech for example), it nonetheless much more typical of a PitchFactor at Eventide for example (I only compares the octaver part thereof) which sounds much more "clean". 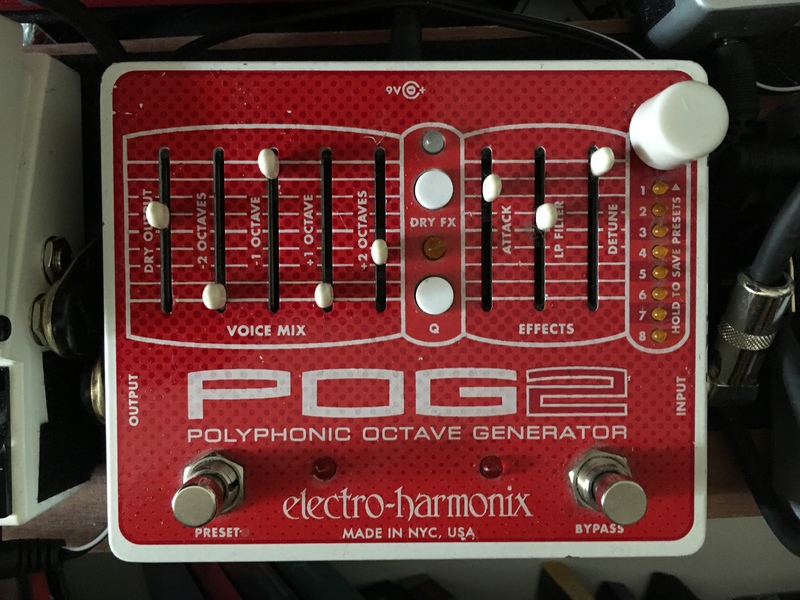 The POG2 has a tendency to sound in the vein of an organ. This is also a little lack of sound quality (or vice versa). This gives incredibly powerful and deep bass, but the attack and resonance of the notes is very typical. Do not hesitate to listen to the many demos on the web to get an idea of ​​the grain and sounds that delivers POG2. In the end, I had two and recently I switched on the PitchFactor. But that said, nothing replaces this quite unique in sound and grain: it is powerful, powers chords take off (unless there note octaver effect is more accurate and efficient) and is POG2 mix very well with a distortion delay eg unique atmospheres! The POG is one of very very good Electro Harmonix effects, which are references in their genre, and unavoidable for certain sounds (U2 Magnificent example). Nine for 290 € it's still quite expensive for an effect that is not necessarily obvious place (same composition) and therefore that is rarely engaged (except maybe for the most noisy / texturistes of us) . But that said, if I remember to take a good price I might be tempted!